If you haven't heard the story of Alexis Gould, you can read more about this strong young lady here. 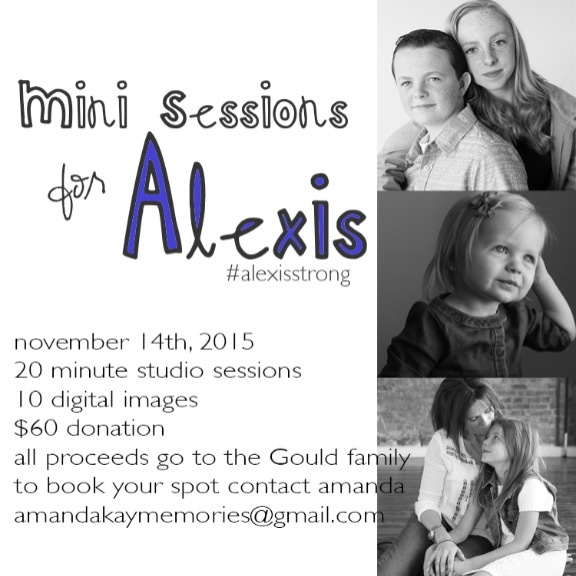 If you want to help, I'm hosting mini sessions November 14th from 11am - 4pm. These will be 20 minute sessions in a studio setting at Brickyard Plaza in Salt Lake City, Utah. I am hoping to have back to back bookings and give this family a nice chunk o' change. 100% of the donations will be given directly to the Gould family for Alexis's medical costs. This is great idea! Any chance you will add another day? I have thought about it, but haven't decided yet. I appreciate your support and if I decide to host another day, I will let you know!